I’d like to try a few classes before I join. Can I do that? How long will it be before I’m hitting people? How long will it be before I’m wearing armour? Do you wear belts? I don’t see any? What do you do at a grading? Do I have to buy my own armour? How come that strike wasn’t a point? Is Kendo good for self-defense? How much does it cost to do Kendo? Kendo’s Awesome! How come more places don’t teach it? We encourage people to come out and experience a few classes before making a decision to join. Wear comfortable workout clothing. We’ll supply the rest. What exactly am I going to learn when starting out? You’ll start with a wooden sword (bokuto) and learn the basics of Kendo footwork, sword motion and body mechanics. You will also learn basic vocabulary and etiquette at this stage. From there you will progress to doing the same basic techniques with a shinai. As you demonstrate proper form and control you will progress to performing those techniques with a partner (i.e. actually hitting something/someone). We will also begin introducing Kata (traditional forms) into your training. All classes are taught by Sensei Mark Kawabe (5th Dan), the Chief Instructor of the Niagara Kendo Club. Senior students may run portions of the class while Sensei is working with individual students. In the event Sensei Kawabe is not present at class (which is rare), either a Sensei from another club will be present to oversee the class or a senior student will be in charge. When you demonstrate proper form and control. How LONG it takes for you to get to this stage depends largely on your own willingness to do the work involved. Most people take a month or so to get the absolute basics down at which point they will likely start doing basic striking drills with a partner. Kendo is a full-contact martial art. Strikes are done in a controlled fashion. The inability to demonstrate adequate control is not a physical problem – it is one of attitude. Any excesses of attitude are unwelcome and will be dealt with appropriately. How long will it be before I’m in armour? In case you don’t know what bogu is, it’s the armour that Kendoka wear. How long it takes to get into it is almost entirely up to you. If you are applying yourself well in class and developing proper technique, you will likely be wearing bogu within three to six months. Your Sensei will make the final decision. It is important that basic techniques be learned properly and consistently executed well before a Kendoka is granted the privilege of wearing bogu. Do you wear belts? I don’t see any. No. However, Kendo does have its own set of grades, starting with Kyu and advancing to Dan. What does it all mean? Adult beginners start at 6th Kyu and work their way up to 1st Kyu, which is one level below Shodan (1st Dan – 1st Degree Black Belt). Junior students (age 16 and under) begin at 9th Kyu. Kendoka are usually graded at their home dojo up to the rank of 2nd Kyu. 1st Kyu examinations (and up) are performed at the Canadian Kendo Federation gradings each December. Personal opinion piece first… If you’re getting into a martial art simply for the purpose of getting a belt, then don’t bother. Success in Kendo or any other martial art doesn’t depend on the rank achieved but by how the martial artist lives their life as a whole. If you have a fifth degree black belt but you’re a twit to everyone who knows you, then you’re just a twit and in my opinion, your rank is meaningless because you haven’t truly learned any important lessons from your training. Gradings are held once or twice a year within a dojo and if the head Sensei feels you’ve progressed enough to go further, then you’ll be allowed to attend gradings in Toronto. Depending on when you started, it will take 2 or 3 years to achieve Shodan ranking in Kendo. So, if you started in November, you will be graded in-house the following year and likely allowed to grade for 1st Kyu in December the following year. You will then be eligible to grade for Shodan the following year. Another opinion about “black belts” for the uninformed: A black belt is meaningless. Being involved in Kendo or any other martial art is a life-long journey. What rank you are is only important insofar as you are learning more about the art and yourself. You are never truly a master of any art as there is always something more you can learn about it. Your knowledge is NEVER complete. In-house gradings consist of a written and practical exam. The written exam consists of a variety of multiple-choice questions, some fill-in-the-blank questions and others that require short written answers. The practical exam consists of an evaluation of basic techniques, including bokuto-waza and kata. The number of techniques you will be asked to demonstrate is based on your experience. It would be a lie to say getting hit with a shinai doesn’t hurt, but the more you train, the less you will notice strikes. Kendo, when practiced properly, doesn’t rely on strength to make a clean hit although a certain amount of power is necessary. Over time, your body “hardens” to getting hit and a strike that may have caused a bruise to your arm when you were a beginner will cause no visible effect three months down the road. That being said, you can expect to get bruises in Kendo, just as you would expect to in any other full-contact physical activity, including Tae Kwon Do or Karate. Kids do practice with adults and adults practice with kids. All students are expected to control their strike strength depending on who they are practicing with. Do I have to buy my own bogu? Yes, eventually. We have several sets of bogu available for rent to students for a reasonable monthly fee. How come that hit wasn’t a point? 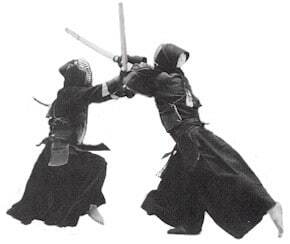 Points in Kendo are based on KI KEN TAI. a shinai, but that’s not what Kendo’s about. your opponent with and have it count. In tournaments, the point also has to be clearly seen and judged as proper by two out of three judges. Proper self defense means avoiding a situation where physical intervention is necessary. This has nothing to do with physical ability – it requires knowledge and understanding of human behaviour, attention, awareness, social skills and only as a last resort should physical self-defense be necessary. Do we teach self-defense in Kendo? No. If you understand what self-defense really entails, the same can be said for the majority of martial arts dojos. See our “join the club” page. Kendo in Canada is usually run on a non-profit basis. Most instructors do not get paid for teaching Kendo – they do it because of the love of the art, not because it’s their day job. Exceptions to this are at some multi-purpose martial arts facilities where the head instructor of the club is also the owner of a for-profit martial arts business. This is an exception, not the norm. Because Kendo has not been commercialized and watered-down to be more acceptable to North Americans, most people are not aware of its existence. If it were commercialized, you would see a lot more advertising for it.